Halloween is fast approaching and the UK is getting just as mad about this scary day as the USA. That’s why America’s famous smooth and creamy SKIPPY® Peanut Butter, is the perfect ingredient to give your party a real American-style creepy yet creamy treat. Terrifyingly easy to make together as a family, these SKIPPY® Peanut Butter Spooky Cookies are guaranteed to cast a spell over true peanut butter fans, to make your party stand out from the chilling crowd. This frighteningly good peanut butter from across the petrified pond is super versatile and has a creamy texture that melts in the mouth. It’s made from high-oleic American peanuts, so your treats will be healthy as well as horrifically good! 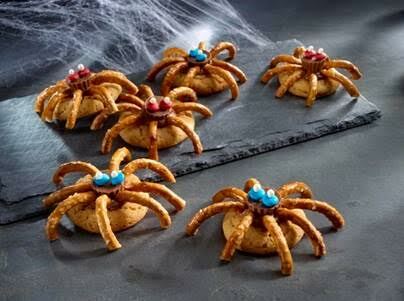 Why not conjure up these SKIPPY® SPOOKY COOKIES with your little ghouls and goblins. A truly creepy confectionery that’s guaranteed to treat not trick your ghoulish guests. 5. If decorating like spiders, gently press mini chocolate button or chunk into top of each cookie while still warm. When chocolate starts to melt, attach thin pretzel "legs" by placing end of pretzel into melted chocolate. Cool completely then attach mini coated candy pieces for "eyes" and mini sugar pearls for "pupils" with peanut butter. Drumond Park's Gross Magic - Review & Giveaway!